Solar Team Twente has driven 633 kilometres on the first racing day and is now on sixth position in the World Solar Challenge. The great qualification session of yesterday lead to a pole position. Today at the start however, a blown motor controller lead to a delay. The controller could be replaced in 20 minutes. But every minute counts and the unpredictable traffic in Darwin made that the team ended up in a traffic jam. The team is recovering quickly, overtook 18 solar cars and reached a top speed of 105 kilometres an hour. The car functions perfectly and shows great stability. 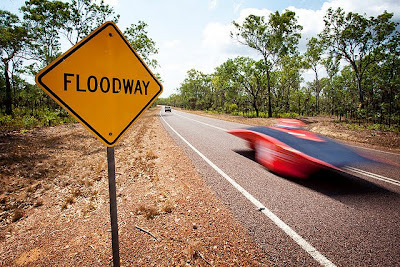 During the first media stop at 317 kilometres from Darwin the team had already overtaken 15 cars and was in ninth position. Racing driver Barry Vree: “Now I know how a F1 driver feels when his car halts just after the start. Bad luck. But it’s a race and things can change. The car felt good and we had an average speed of 80-85 kilometres an hour. Overtaking so many competitors was great fun. Only in Adelaide, we’ll now the consequences of this mornings casualty.” The goal for today was to drive as far as possible in order to reach the leading cars.